Early adoption of renewable energy helps jump start the transition to a low-carbon economy via a reinforcing feedback loop. Anything that diminishes early adoption of renewable energy – including competition from ultra-cheap fossil fuels – slows down this transition. Recent reports that unusually low natural gas prices in the US may be weakening homeowner’s enthusiasm for investing in solar panels are a cause for concern, especially considering a dynamic we have begun exploring with En-ROADS (our interactive scenario-testing tool that explores the dynamics of creating a low-carbon economy). In En-ROADS, just as described in the latest news accounts, when there is a lot of cheap gas around the growth in renewables tends to be slower. On the surface, these reports seem to be telling the tale of a one-time event: cheaper gas this year means fewer new solar installations this year. That’s true, but it’s not the whole story. 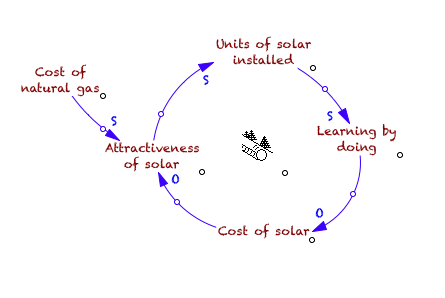 Consider the virtuous cycle shown in the diagram above: with more units of solar installed there is more learning by doing. Costs of solar fall, leading to greater attractiveness of solar and even more units of solar installed, and so on. But here’s the glitch – if the falling cost of natural gas makes the attractiveness of solar decline, then the early installations that launch the virtuous cycle falter, and the whole reinforcing process can lose momentum. The impact of cheap gas is NOT just a smaller number of new installations this year; it’s a future loss in the speed at which solar becomes more affordable. Think of money not invested in a retirement account; it’s not just that the balance is lower, but that a lower balance earns interest more slowly. There is growing awareness about the downsides of natural gas, starting with the impacts of its extraction. Like most of our energy options, natural gas comes with side-effects. Some are measured in contaminated groundwater. Others are even more subtle, woven into economic feedback lops, and resulting in the weakening of a possibility, just when we need it most. As systems thinkers, this is a lesson we see again and again. From sneakers made in sweatshops to chemical-laced agricultural products, if a society prioritizes the inexpensive above all else, eventually, consequences begin to pile up. If we orient towards what we really want, not just towards what is cheapest now, and if we look carefully at the structure of the systems we live within, we can design smart policies that prioritize the our real goals, from adequate access to energy to a sustainable future for our children.